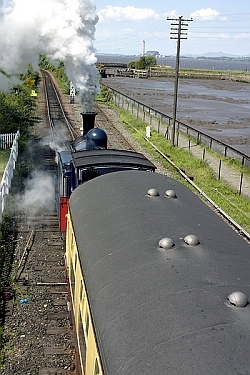 The Bo'ness and Kinneil Railway is owned by the Scottish Railway Preservation Society which is dedicated to the preservation of equipment and artefacts from the age of steam trains. 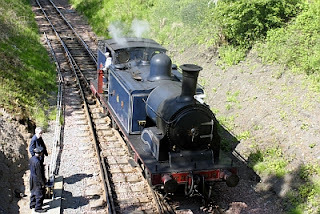 At Bo'ness there is a station and a railway museum with steam trains runing throughout the summer to Birkhill Station and, since 2010, to Manuel. The station at Bo'ness was originally situated in the village of Wormit on the south side of the Tay Rail Bridge and includes an authentic ticket office from the days of steam. 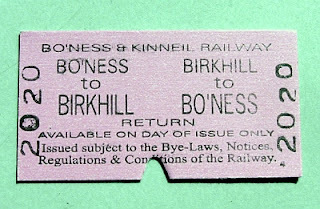 The railway tickets are also authentic being made of thick cardboard, unlike the modern larger rail tickets today. Passengers can either sit in the first or second class compartments for their journey. 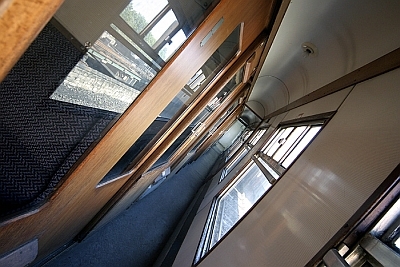 The first class seats are in small compartments and the second class seats are in an open carriage. We sat in the First Class seats on the outward journey and the Second Class on the return one. Steam trains are different from modern diesel or electric trains in that they need some combustible, such as coal, to power a steam engine. The locomotive carries fuel and water supplies on its journey. 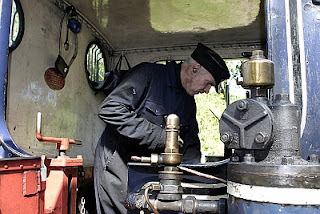 While waiting for the train to depart, there is usually plenty activity by the train crew stoking the boiler and adding water to the engine. This has to be done before every new journey. When the train leaves Bo'ness Station, it runs along the coast before turning inland at on its way to Birkhill Mine. 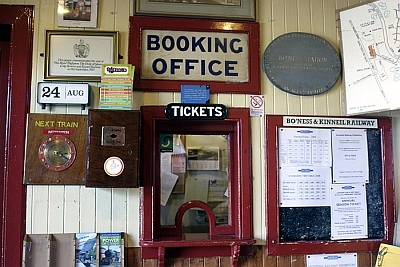 A ticket collector, dressed in a uniform from the 1950's is on board to check the passengers tickets. He carried a small punch to validate passengers tickets. The locomotive pulling the carriages was a Caledonian Railway No.419 which was a 439 Class steam locomotive originally from the Caledonian Railway and was built at St Rollox Works in Springburn in Glasgow in 1907. It was designed by J.F. McIntosh and 92 engines of this type were built between 1900 and 1925 in Glasgow. 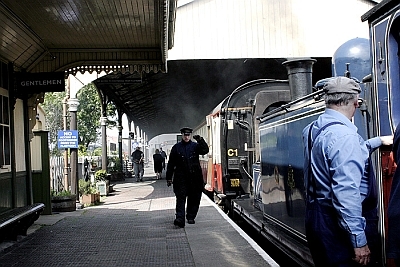 The smell of the smoke from the engine adds to the enjoyment,as it leaves passengers in no doubt that they are on a steam train. Good views of the River Forth and the Ochil Hill can be seen during the journey. 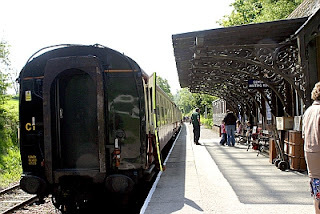 The first stop on the journey is at Kinneil Halt and passengers can alight here to enjoy a walk along the shore or visit the Kinneil Nature Reserve - both of these provide excellent views across the River Forth to the Ochil Hills in Stirlingshire. The Kinneil Estate and Museum is a 15 minute walk from the Halt and worth a visit. The next stop is Birkhill Station and passengers can alight and visit the clay mine or look around the station. The train stops for about 20 minutes before continuing on its way to Manuel. 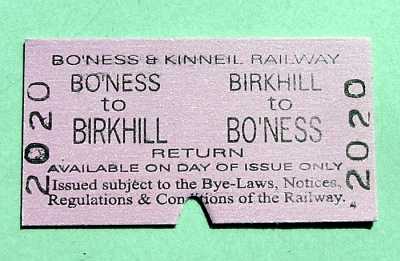 Most passengers left the train at Birkhill to visit the mine and travel back on a later train. The last stop is Manuel but there is no station there and the train is reversed for the return journey. It is worth watching the points being reversed. The return journey follows the same route as the outward one. 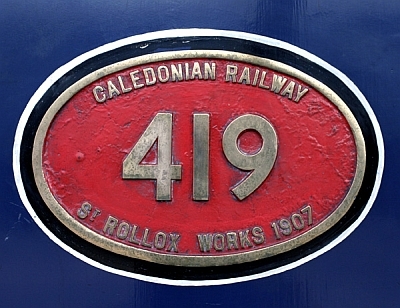 The railway and locomotives have featured in many films and recently was used in the filming of the new Ewan McGregor and Nicole Kidman film. This was a great day out and allowed passengers to be transported back in time when the railways were dominated by steam trains.